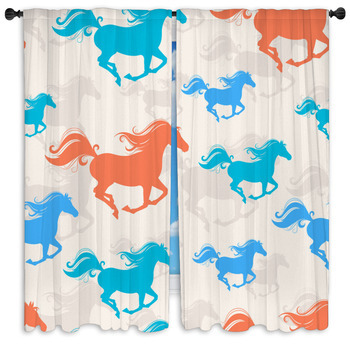 Horse-themed bedrooms and bathrooms are popular for horse lovers of all ages. 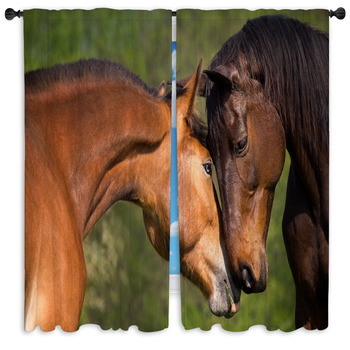 It is likely that the enthusiast has horse photos, shower curtains, rugs, and bed settings to decorate -- but horse window curtains bring something new to the table! 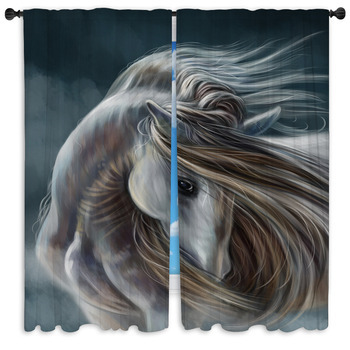 Depicting the image of your favorite animal right on the curtains of a room is a bold way to liven up the room, show off your spirit, and still make the place look unique. Equine lovers can be of any age. 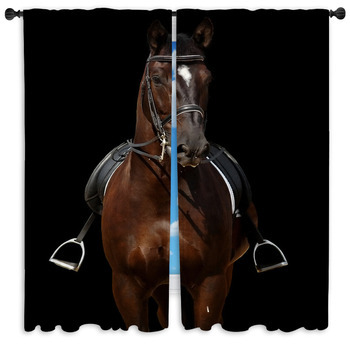 For a child's room, something more fun and vibrant should be chosen to maintain the youthful aura of the room while still adhering to the love for all things equestrian. 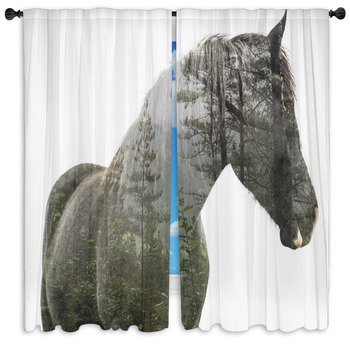 A photograph of a horse on the windows might be too realistic and not bring enough fun to the room. 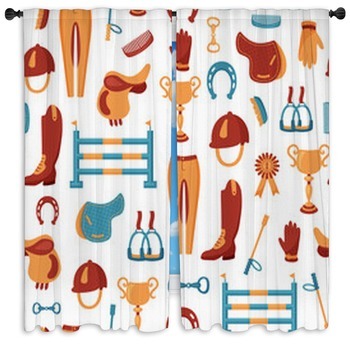 That is why there are cartoon-like horse window curtains which flaunt lots of bright colors and fun-looking horse adventures. Those who enjoy photographing these creatures will be blown away by the stunning black-and-white action shots on some of the horse window curtains. Not only are these photos beautiful to look at, but they will bring a sophisticated element to any room. Additionally, the greyscale color scheme makes it easy to fit into the decor of any room without appearing to clash with other colors. 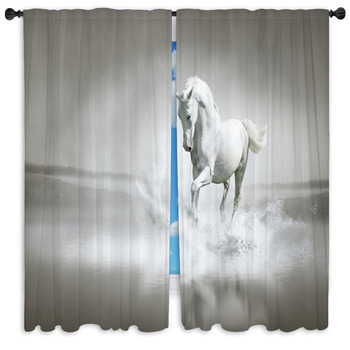 Even artists who are not equestrian enthusiasts will have to admit that the bathroom window curtains with horses on them are interesting to look at and can give a bedroom or bathroom a very unique and artistic feel. They are a great addition to a room belonging to a teenager who is into the visual arts. The sketches will provide a casual feel which does not lean too far toward sophisticated or childish. 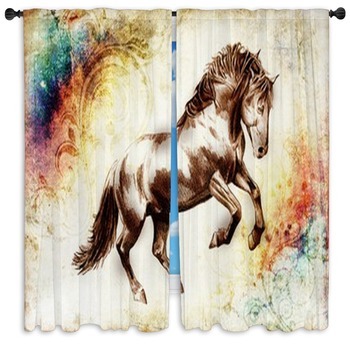 Horse curtains depicting images of the animals in colorful landscapes will brighten up any room and are appropriate for occupants young and old. The colors will make it fun to accent the rest of the room by choosing coordinating accessories, such as bathmats or rugs. Additionally, the portrait is pleasing to the eye and will be the focal point of wherever you choose to let it gallop! 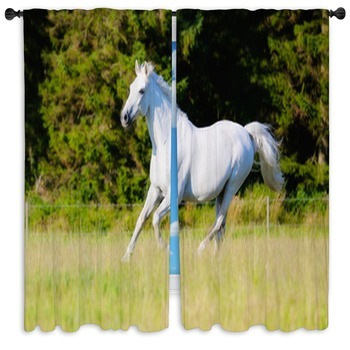 Horse window curtains are a must-have for the bedrooms and bathrooms of the creature's biggest fans. 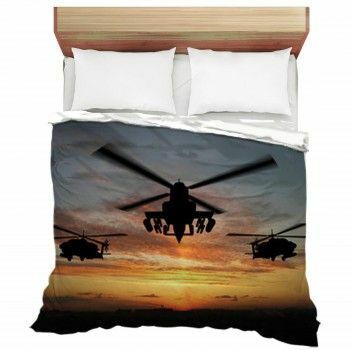 There is no better way to show off your spirit than by decorating one of the largest focal points of the room with its image. Ranging from fun to majestic to artistic design, there are options to suit the personality of any person and the decoration scheme of any room.